Researchers discovered tiny shark teeth in South Dakota, in the same place where SUE, the most complete (and rather large) T.rex specimen was found. Field Museum volunteer Karen Nordquist working at the microsorting station in the fossil prep lab. That was what Terry Gates and Karen Nordquist did. They had patiently sifted through the leftover sediment that came from the rock that surrounded the bones of SUE, the most complete T.rex specimen ever discovered. A paper on their discovery was published in the Journal of Paleontology. "It amazes me that we can find microscopic shark teeth sitting right beside the bones of the largest predators of all time," says lead author Gates, a lecturer at North Carolina State University and research affiliate with the North Carolina Museum of Natural Sciences. 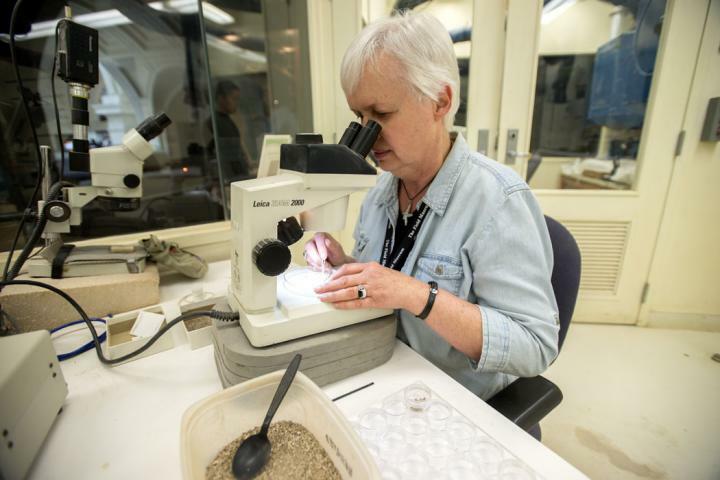 "It was so tiny, you could miss it if you weren't looking really carefully," says Nordquist, a retired chemist who has been microsorting for the Field Museum for fifteen years. "These teeth are the size of a sand grain. Without a microscope you'd just throw them away." Measuring about 12 to 18 inches long, the shark, subsequently named Galagadon nordquistae, was a small shark that lived during the Cretaceous period. Judging from the teeth, its prey consisted of small fish, or snails and crayfish. The name came about due to its similarity in appearance to alien ships in the 1980s video game Galaga. The presence of the fossilised teeth is challenging the scientists' perception of the area where SUE had been found, in the Hell Creek Formation of South Dakota. "We had always thought of the SUE locality as being by a lake formed from a partially dried-up river—the presence of this shark suggests there must have been at least some connection to marine environments," says Pete Makovicky, the Field Museum's curator of dinosaurs. "Today, carpet sharks, which include bamboo sharks and wobbegongs, mostly live in the waters in southeast Asia and Australia, so it's surprising to find their fossils at the SUE locality. During the Late Cretaceous the continents continued to drift apart, further isolating dinosaurs and other land animals, and at the same time created the Atlantic and Indian oceans. With occasional seaways connecting these young oceans, we have found fossils of marine life flourishing globally, including Galagadon and its relatives. " says Eric Gorscak, a research associate at the Field Museum.